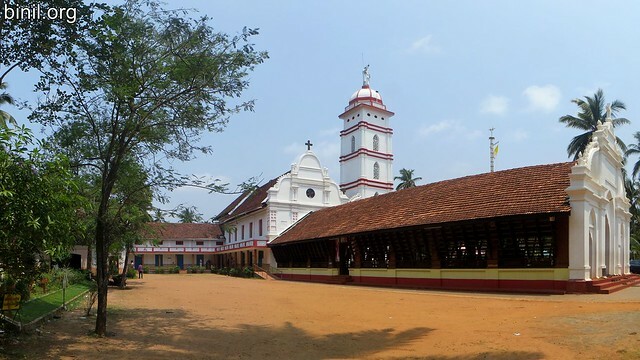 St. Thomas Archdiocesan Shrine Palayur or St. Thomas Church, Palayoor or St. Thomas Syro-Malabar Catholic Church, Palayur is located near Chavakad, Thrissur. It is said to be established in 52 AD by St Thomas. Its one of the oldest churches in India. It was part of the seven churches that that St. Thomas established in India. The church was substantially refurbished in the 17th century. Its one of the few churches which shows the traditional Kerala design. You reach this church from Thrissur on the way to Chavakad via Pavaratty (around 28km). Its only 3 km away from Guruvayur. On Pavaratty you can also visit St. Joseph’s Parish Shrine. Below are some of the pictures or photos of this beautiful church.